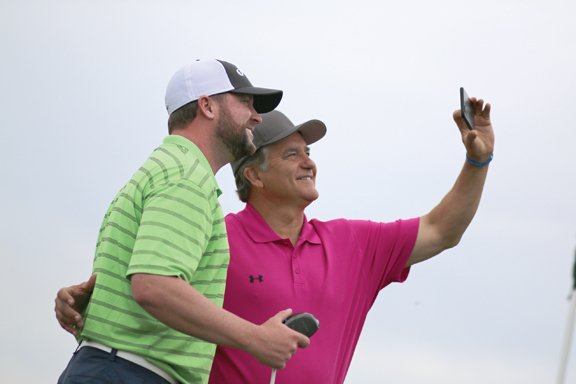 MARQUETTE — The first day of summer passed a day earlier and the bright, sunny weather that comes from the season was on display Thursday morning to create the perfect setting for the seventh annual Upper Peninsula Celebrity Golf Classic at the Marquette Golf Club. Dozens of golfers descended on the Greywalls and Heritage courses to help raise money for Beacon House, the hospitality house for hospitalized patients and their loved ones located downtown. There were newcomers to the event and they were ecstatic to raise money for the facility. Former NFL running back and kickoff return specialist Leon Washington was one of them. It didn’t take him long to not only fall in love with the cause, but the U.P. as well. “I played football with (event co-host and former NFL kicker) Jay Feely back with the New York Jets and he told me about this great event up here and I couldn’t pass up on it,” he said. “Now that I’m here, I feel blessed that I came. “Everyone here is wonderful and they’ve been respectful. They’ve made me feel at home and it’s a great cause, too. I love it up here. I got in a 6.5-mile jog in along Lake Superior. It’s just been awesome. “When I first heard ‘Marquette,’ I heard about the college basketball team, so I had to Google it and I found out that it’s almost by freaking Canada. It’s really beautiful here, though, and the weather is great. Another Celebrity Golf Classic rookie was former NFL long snapper Nate Boyer, who was also a Green Beret in the U.S. Army. Boyer had never set foot in Michigan before this week and said that he would be back next year. “Jay reached out and since kickers are a mess all the time, I thought I’d come out and straighten him out,” he said. “I work with a lot of veterans’ organizations, but it’s nice to expand your horizons and work with different groups. There are a lot of people in need out there and this is just a great opportunity to help them out. It wasn’t just newcomers on the links, though. Hockey players Zach Trotman and former Northern Michigan University player Justin Florek were back again. Trotman is under contract with the NHL’s Los Angeles Kings and is currently with the team’s American Hockey League franchise, the Ontario Reign. He was happy to be back supporting the Beacon House and hopes to get more hockey guys involved. “I keep coming back because it’s a great environment with a great cause and great people,” Trotman said. “You don’t always hear where your efforts are going to. You know it, but until you see how much it means to people, it really hits home. While his former Boston Bruins teammate is remaining stateside this coming season, Florek will head overseas this season to play in Germany. He said that it will be an adjustment for him, but he’s eager to start a new chapter in his life. He also plans to continue to support the Beacon House and his hometown of Marquette as long as he can. “It’ll definitely be a new experience and maybe a culture shock, but we’re ready to face it together and we’re embracing it,” he said. “People in the U.P. understand how important this is, but to see outsiders come in means a lot. It shows how much others care and it helps showcase the community as well. Although athletes and sports personalities made up the majority of the golfers, there were other celebrities at the event, including Audio Adrenaline lead singer Adam Agee. Just like the sports guys, though, Agee was glad to be there and thinks the whole setup is just a great experience. “I love it when people come together for a cause and doing events that benefit places that serve people and take care of people when they need it the most,” Agee said. “Anytime where I can be involved to help people like that, I want to be a part of that.